A tray of freshly baked muffins is hard to resist and if you follow this recipe, you will be able to make the perfect mini cakes that should rise up, and be both crumbly and moist. Many people like to add a little something extra to their muffin mixture, such as chocolate chips or blueberries. For us, the magic ingredient is frozen raspberries. Lovely bake-off judge Mary Berry would probably say that fresh raspberries would be better, as they won't 'bleed' into the cake once they are cooked, although we personally quite like the marbled effect that the juices of the frozen raspberries creates. If you use a non-stick muffin tray and grease the coating, you won't need to use any paper cases, as your cupcakes won't stick. If your oven tray isn't quite as reliable, then you should probably use paper cases, or cut out some individual squares of greaseproof paper and use these instead. Cream the softened butter (or cooking margarine) and sugar together in a large mixing bowl and add a spoonful of the flour - this will help to prevent the eggs from curdling. 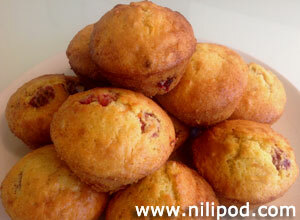 Slowly add the eggs separately, beating well as you combine them to your muffin mixture. Sieve the flour and fold this into your cake batter, so that all traces of flour vanish. Finally, stir in the raspberries, the last of your recipe ingredients, and spoon the mixture into a greased non-stick muffin tray with 12 holes, filling the holes just below the top, using paper cake cases if you want to. 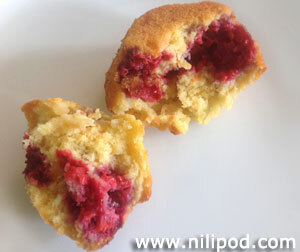 Bake your raspberry muffins for around 20 minutes (until golden in colour) in an oven that has been pre-warmed to a temperature of 200°C. Check your cakes after 15 minutes and turn the tray to ensure an even bake, being careful not to knock it.